This a revised version of a page which tries to answer the question of how much better an NTP server for remote PCs the Beagle Bone Black would make than a Raspberry Pi. They are both simple but powerful Linux computers on a card powered from a single +5V supply (over USB) and have an Ethernet and other ports. So the major hardware difference which people have discussed is the direct connected Ethernet port on the BBB (BeagleBone Black) versus the USB-hosted Ethernet port on the RPi (Raspberry Pi). All three cards were similarly configured, although the OS on the RPI was compiled locally and the other two were the most recent current downloadable versions at the time. As far as I know, no similar comparison has been published. Two minor optimisations were made - choice of the BBB Linux variant and reduction of the RPi Ethernet latency. The full BBB OS enables many unnecessary services for this application by default. Here are graphs showing the difference in CPU loading between full (up to 14:00 March 22) and console (after 16:00 March 22) Linux builds. In this display of the results, the offset is sampled at five minute intervals by MRTG. Another set of data from which results can be displayed is the loopstats reported by NTP itself, if you enable that in the ntp.conf file. Here are plots of what data was available before and after the change of OS. The offset reported by NTP shows a more spiky nature with the full OS, and that spikiness is not as not as easily seen in the MRTG data. The one-hour RMS jitter (black line in the graph below) is always under 2 microseconds with the console OS, but varied up to over 4 microseconds with the full OS. The jitter is also less spiky, although possibly at a slightly higher base level. Even the 2-hour averaged jitter show much less variation. Both BBB & RPi were fitted with similar GPS units which were to hand (Adafruit), but the locations were different. Examination of the loopstats shows that the poll interval remained at 16 for both systems, so the PPS signal was adequate at all times. However, on powering up the BBB it was noticed that its GPS didn't lock, and a short while later it was noticed that an adjacent RPi's GPS wasn't locking either. To get the BBB working it was necessary to add a separate magnetic mount GPS antenna, as the board itself seems to produce enough interference to block nearby GPS reception. The BBB was subsequently relocated away from other GPS receivers. This interference issue could be a serious problem if a compact unit is desired, whereas mounting a GPS card on the RPi presents no such problems. The best performing GPS receiver I have found to date is the ublox 8Q unit, such as used in the HAB supplies card. The NTP offset as reported by the BBB is rather worse than that of the RPi. Both systems are using GPS/PPS sources with kernel-mode PPS interrupt handling, but without the kernel PLL timekeeping. The question is more whether the USB connection of Ethernet produces a degradation of the time offered to a remote PC, so a Linux PC also with a GPS/PPS source was configured to measure the peerstats of each of these three devices, with the following results. The results, for the day of 2015-Mar-26, are presented sorted in two ways: ascending RMS offset, and ascending RMS jitter. Should you wish to analyse the original peerstats and loopstats you can download them here. 127.127.22.0 PPS fine seconds In heated room #1, Garmin GPS 18LVC on the roof. 192.168.0.71 Raspberry Pi #1 In unheated cupboard, more stable temperature. On the basis of this fairly simple test, the BBB is the better server when measured either in terms of the RMS offset or the RMS jitter seen at a remote node on the same LAN. However, both card computers are more than adequate as an NTP server for a large majority of environments, and if you really want to do better you need to attach a PPS source to your PC. 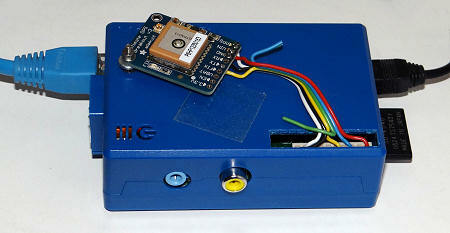 Be aware of the potential interference to GPS which a BeagleBone Black may create. Support is arguably better for the much more popular Raspberry Pi, and this is a factor which should not be overlooked. The base BBB Linux is supplied with far too many services enabled and running (e.g. Apache Web server) to make the best NTP server, so the much stripped down Console variant is recommended instead. Note that with this variant you will need to add quite a few utilities such as a compiler before you can even build NTP. I would welcome further comments, which may be quoted and acknowledged here. My thanks to those who have more experience than me with these small card computers and the Linux operating system they run. @PaulM: I've had words with PCB layout experts about the BBB PCB layout. "Better" was not among them. @2e0sql: I was never impressed with mine (BBB). @asridge: Interesting read David, thanks!! was looking at the BB as an alt(ernative) to a Pi ... on the list of things to do, but you beat me to it. Attila kinali: The BBB is known to have a bad EMI (RF interference) behaviour. You should not put any sensitive RF components near it, without proper shielding.